Mass Effect, BioWare's epic sci-fi videogame that looks like a movie, is now on its way to actually becoming a movie. Legendary Pictures, which has co-produced films like 300, The Dark Knight, Watchmen and Clash of the Titans, has signed the rights to a Mass Effect movie, according to the Heat Vision blog on The Hollywood Reporter. The project is still in the early stages of development so no director or cast members have been named, but I Am Legend screenwriter Mark Protosevich is reportedly in talks to write the film. BioWare co-founders Ray Muzyka and Greg Zeschuk, along with Mass Effect Project Director Casey Hudson, will serve as executive producers. 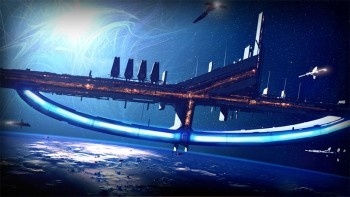 The report claims that while a big-screen translation of Mass Effect would require a "massive commitment," the success of Avatar has demonstrated that audiences will "follow and invest themselves in non-human characters if given a reason to, which opens the door" for more films in which alien species and settings play a major role. Mass Effect, of course, features numerous alien races interacting in a galactic partnership in which humanity is very much a junior member. I don't disagree that Mass Effect could be made into a great movie, I'm just not convinced that it should. I've begun to think that the reason videogame movies fail is simply that for the so-called "built-in audience," which is to say gamers, the experience is inevitably diminished. Why would I want to watch Shepard when I've already been Shepard? Still, the prospect of a Mass Effect movie does have one undeniable upside: We get to play a new round of Cast That Film! Which is a bit of a hairy prospect itself since, as pointed out to me by a Concerned Fan, a lot of Commander Shepards out there are of the female persuasion. So I'm nominating Mickey Rourke for Wrex but beyond that, I'm pretty much out of ideas. Who's it going to be?